YES. I am an outfit repeater - but who isn't!? 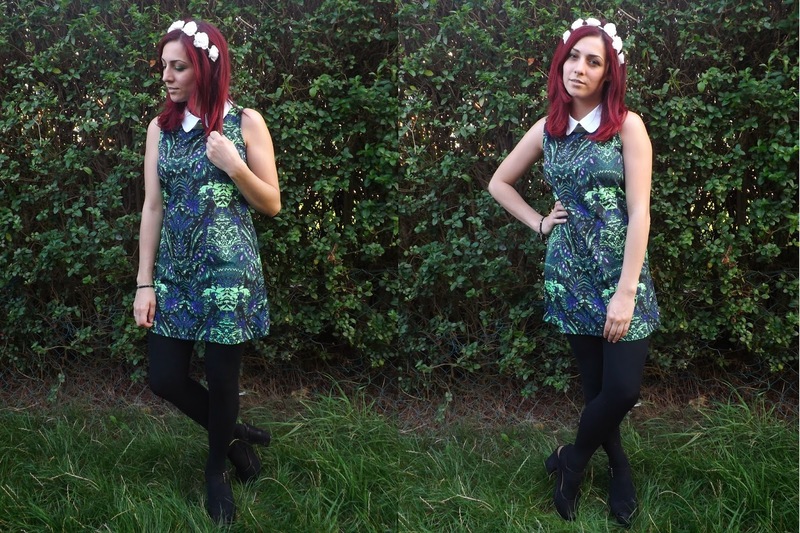 And who says you can't blog the same dress twice? Clothes were made for wearing, and styling over and over again, and I like challenging myself to wear things differently - It's what styling is about! I do it often with other pieces, but a dress is a little bit harder to style differently. I ditched the cardigan this time, went for different shoes and a floral headband to girly up my attire. This is one of my favourite dresses in my wardrobe right now, and has been since it made it's way into my wardrobe early spring... I think the colours suit the winter a little better though, so I'm pretty sure I'll be wearing this a lot more often this coming season. Outfit repeating isn't a fashion offence - it's embracing the love for certain pieces.... Even Kate Middleton is guilty of it, but so what!? If royalty can do it, so can we! On a tangent now... I need help! I'm really on the fence about dying my hair back to a rich dark brown colour. Shall I go dark for the winter or embrace red longer!? If I do go dark, I'm contemplating a lilac dip dye along with it...!